The “Mechanic” trying to fix the relay with his daughter. Day 33 was one of the most gruelling and frustrating days on the rally but it ended with a great surprise. The convoy had taken a battering on the 100 odd miles of Mongolian roads covered the day before; CCBB had major electrical problems and The Baked Potatoes had lost their sump guard. The boys managed to find a guy who had apparently fixed a few rally cars before so Dunc and Henry took Vera to him along with John who took the Mini. Whilst they were doing this Matt went with the others to the supermarket. When they got there the shop was very dark and it turned out there had been a power cut, everyone was however allowed to go in and get some shopping. As they were walking around the lights suddenly came on and they were able to go to the checkout, unfortunately everyone had to wait a good while for the Windows 2000 computers that ran the till to boot up! All of the teams bought some powders that could be used to flavour water, just in case they needed to purify any water in the next few days. Back at the “mechanics” house the Mini’s sump guard had been re-attached and the guy was now looking at CCBB’s relay. He had a few goes at fixing it by linking the pegs with a wire and it seemed to work. The engine ran but would only turn off if the relay was taken out, the key wasn’t even required! Relatively satisfied the boys agreed to enter the Gobi Desert and Rolling Thunder made their way out of town. Well, they made it about 200 yards! After another jump start the boys decided to take the wire off the relay and to just carry on as they were the day before. The next few miles consisted of jump starts, running out of electricity and then rolling to a halt and repeating, Vera must have broken down at least 20 times. A particularly difficult stretch which resulted in a lot of pushing! As the morning wore on though Matt found that when Vera cut out if you turned the ignition off and punched the area of the dash behind which the fuse box was, the faulty relay would stop ticking. Then after that she would restart as normal. Therefore the boys made some progress without jump starts, as they neared lunch. As it was lunch was enforced on the convoy, as CCBB made their way up a hill on the, now entirely, gravel road Vera decided she had had enough fun and games and overheated. The convoy decided this was a good time and place to stop for lunch. Rolling Thunder had taken another member on board in the morning, a group of crazy South Koreans in a VW Polo who didn’t know anything but full throttle! 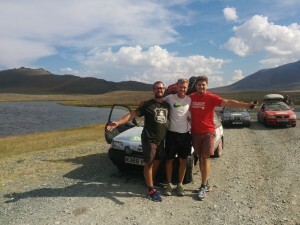 A team photo after a river crossing. After a great lunch of, you’ve guessed it, noodles and a convoy photo the convoy was on the move again. In the early afternoon there were lots of rivers to cross and no real road to follow, nobody really knew where they were going. The river crossings were extremely fun, especially watching the Korean’s blast through and Vera was actually working fine for once. There was a couple of instances where some of the convoy were actually stranded on the wrong side of the river after navigating the cars through, so there were some wet feet! 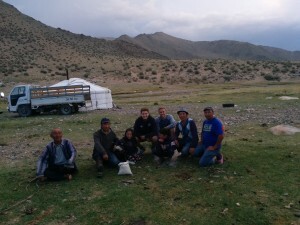 Matt and Henry with the nomadic family. Everything was going well, too well. After some good progress the Mini broke down and wouldn’t start again, CCBB were actually happy it wasn’t them holding everyone else up for once! The stop seemed as though it would be a long one and so the boys elected to turn Vera off. This turned out to be a terrible decision as the morning’s problems returned when the convoy got going again, this time with the Mini being towed by Aston Micra as The Baked Potatoes had failed to get going again. After many more jump starts from The Bourne Dubbers, CCBB decided to admit defeat and asked for a tow from Matt and John. There were a few hills on which the Polo struggled to get Vera up but with lots of pushing the convoy finally made it to a place where they could camp by a river and a yert. 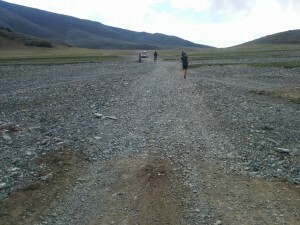 A decision was made to send John ahead to the next city of Khovd with the koreans to try and get some kind of recovery vehicle to come and get the two stranded cars. Matt, Henry and Jennifer went to speak to the nomadic family in the yert to see if the convoy could camp near to the river. They kindly agreed and showed us their cows, sheep, horses and most impressively their eagles; each man/boy has an eagle that they use whilst farming. Just as Rolling Thunder had set up camp one of the nomads signalled to them that a storm was coming and that they should come inside the sturdy yert. They let everyone cook their food on their stove, fuelled by dung, and offered around their own food and drink. This included their extremely strong cheese and some kind of vodka made from that cheese, many found it unpleasant! 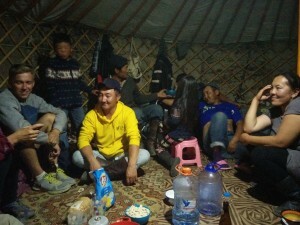 It was brilliant to see the nomadic way of life at first hand and the boys even learnt some Mongolian. They were particularly impressed by the grandad, who was over 80 years old and smoked constantly! After the storm the convoy returned to their tents and looked forward to a lie in, as they presumed John’s rescue would not come until the afternoon at best.